Picked up a real nice HS55 last week. Spent a little time going over it and cleaning it up. The seller told me he believed it had been covered in fluid film its whole life. Turned out to be in amazing condition for its age after a good cleaning. Belts look good, i changed the oil and ordered a pair of skid shoes for the sides of the bucket. I'm going to remove the old worn out ones from the rear. I have not found any solid info on the auger gear oil. What do you guys recommend for auger maintenance? That things cherry. Nice find. Except for the skids. They're worn out. I think it's taken a bit of material off the bucket. Other than that, looks clean. Last edited by Kiss4aFrog; 01-02-2019 at 03:39 PM. Other than that, looks clean. .
Yeah, there is a bit a taken off the bucket. New skids are on the way! 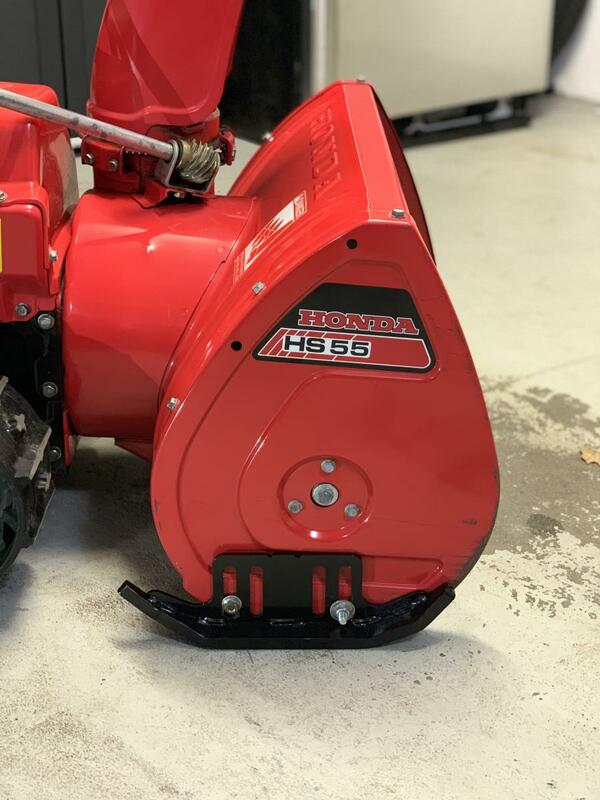 Of all the Honda snowblowers I have had, the HS55 was my favorite. One pull, and the winter fun would begin. well, looks like bottom sides are worn down. could not see side holes for side skids. auger gear box calls for 80-90 W oil. but that is a nice looking unit. I have a couple. just picked up one almost as nice as yours for the front deck. in the spring I will totally go thru it and post pics. Good to hear! I’m looking forward to using it this winter. 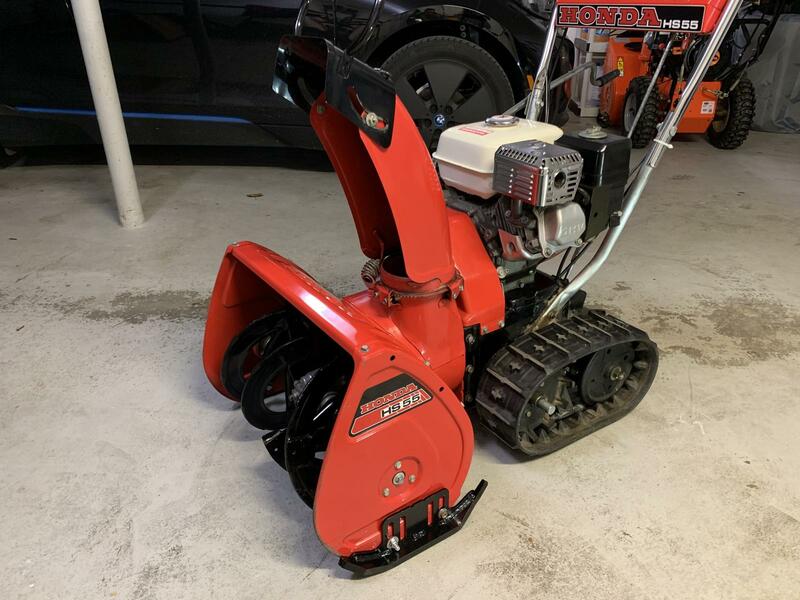 It’s my first Honda snowblower. What a well built machine. 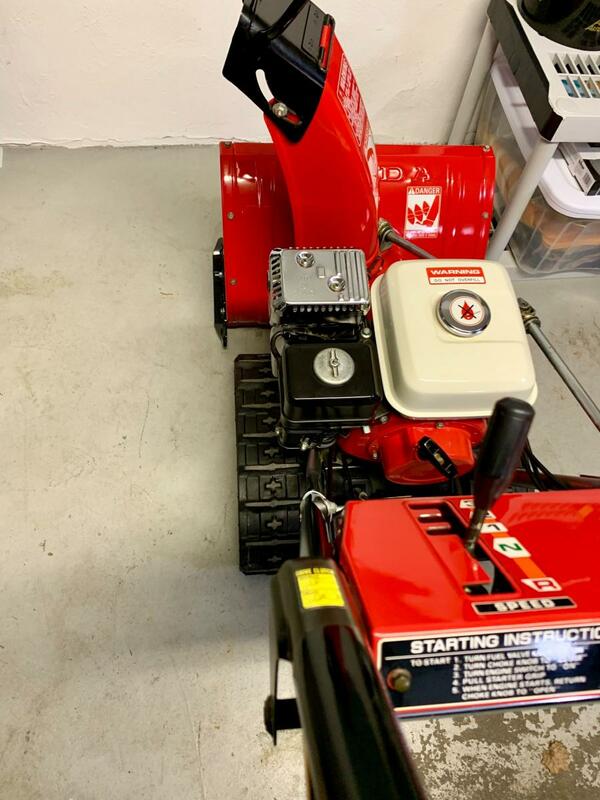 Feels a lot more solid than my 2016 Ariens! It’s actually just that side thats worn down a bit. The other side is fine. The skid on that side was damaged and it looks like it was being used like like that. I installed a pair of armor skids on the bucket today. I’ll post some pics later. It looks like the auger oil must have been changed recently...it was full and clean so i assume it was changed. Here are some pics of tbe armor skids installed. Last edited by PB617; 01-08-2019 at 12:31 AM. 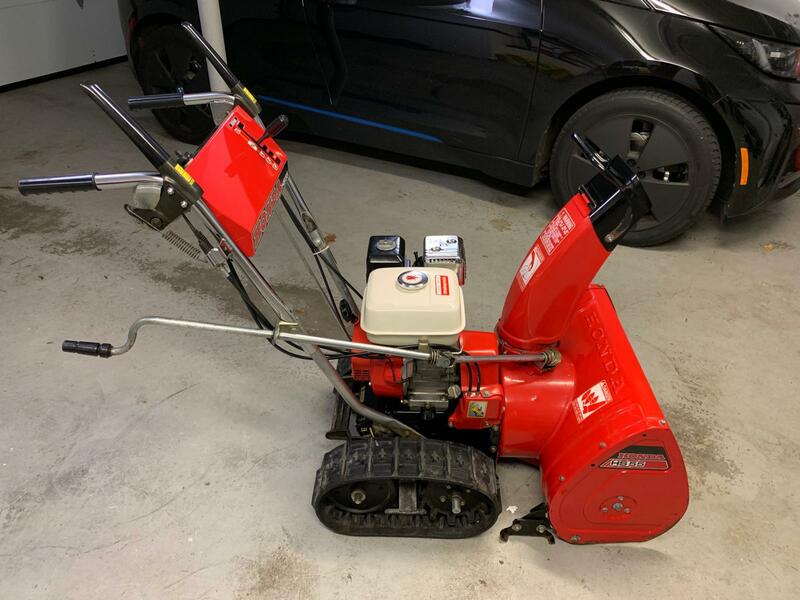 Ran the snowblower for about 20 minutes this weekend to test it out and let it run (no snow, just ran it). After the first 10 minutes that i let it run i shut it down and let it sit for a bit and noticed it leaked a couple drops of gas on the track where the carb is located. There was also a drop or two of oil on the ground. I looked to see where the oil was coming from but im not really sure. Originally when i got it, it was leaking gas from the fuel line not being seated all the way down. Fixed that and it stopped that leak. But now it’s leaking very little and i think it might be from the carburetor spacer? The seals look a bit worn/damaged. I was told the carburetor was taken apart and cleaned and its is an oem, not sure if its original but i’m thinking of changing it for a new one. This is the first time i’m working on a carb so it might be easier to replace it. Now to find where the oil is leaking from...it hasn’t leaked in the past 12 hours that it has been sitting so we’ll see. Hope you find that oil leak. This machine takes less than a quart . either 0.63 or 0.74. will have to double check . leaking carb: is fuel line cracked at carb? it may be the rubber washer on the bowl nut. does it have a fuel strainer cup?you can take it off and look up into the carb part and inspect the rubber washer. I opened up one that was leaking and that washer was missing causing the leak. and then the bowl O ring. One member here used a light vaseline coating around that O ring to stop leaks. Since I learned that It has worked every time. 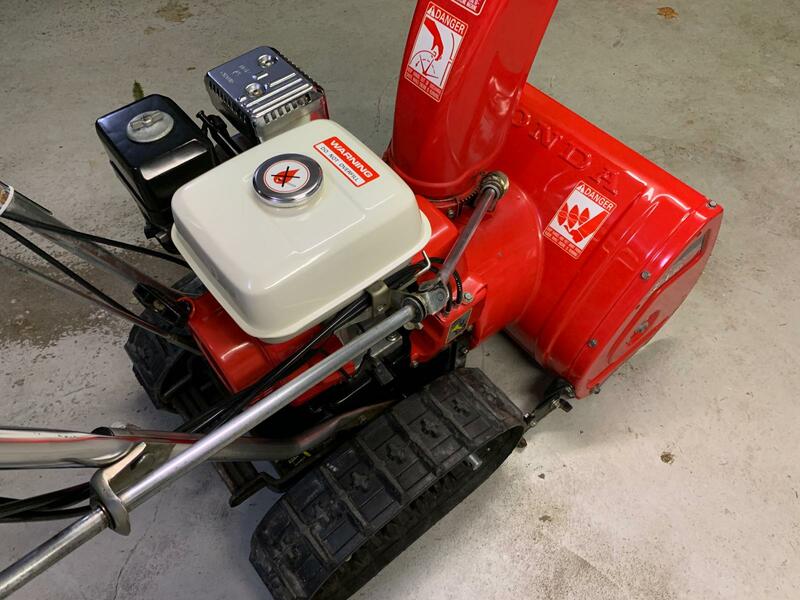 you can shut off gas, drain the gas from the carburetor bowl before putting machine in the service position ( up on it's bucket and support it with something under gas tank. make sure the gas tank is almost empty ) it's easier to work on the carb in this position I have found.